By Becky Holladay. Storage units on East 147th Street and Timpson Place will soon be leveled to create affordable housing. A quiet street nestled in a rapidly changing commercial corner of Mott Haven has become an unlikely center of attention as two developers are duking it out over two very different kinds of projects to transform the block. A lawyer representing a developer who wants to build a new hotel on 147th Street between Timpson Place and Austin Place, came in front of Community Board 1 on May 26, irate that the city didn’t notify his client that it is considering rezoning the small street to change it from commercial to residential. The rezoning would leave his client unable to build a hotel there, he complained. “It completely takes the wind out of this guy’s sails,” said lawyer Richard Lobel, and urged the board to exclude his client’s lot from the rezoning plan. But a principal for Radson Development, which specializes in affordable housing and has developed several South Bronx projects, promised the board his proposal to build 165 affordable apartments would provide the greatest benefit to the neighborhood, and questioned whether a hotel would be a good fit. “It’s not a service for the people that live there,” Rad said, and added that the other landlord spurned his offer of a buyout. Rad hopes to begin construction on the new project early next year, with buildings ranging up to 12 stories and financing from the city’s Department of Housing Preservation and Development’s Extremely Low and Low-Income Affordability program. Two vacant houses and a row of storage units now occupy the north side of the street. On the south side sit two houses that are occupied, alongside the empty, boarded up lot where the hotel would be built. After hearing from both developers, the board voted to support the rezoning proposal, but added a stipulation to exempt the lot owned by Lobel’s client from those changes. Board member Walter Nash, who made the stipulation, lives just a few blocks from 147th. After the meeting, Nash said he was angered that the city had decided to rezone the block without notifying all of the property owners. 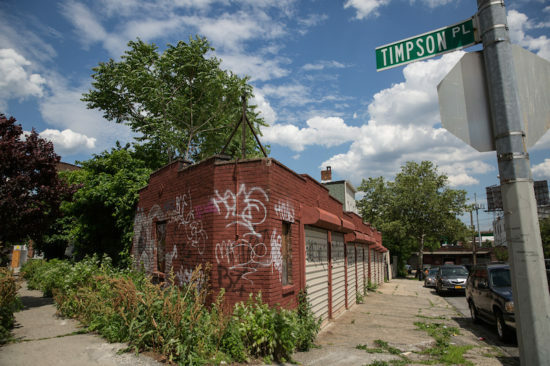 Though 147th Street between Austin and Timpson lies just two blocks from both the Bruckner Expressway and 149th Street, the block is quiet. Even the warehouses on Timpson and Austin emit little rumble. But just two blocks in to the west, construction on a massive new complex with 430 new apartments, 37,000 square feet of retail space and a school for special needs children is well underway. When asked about the future of their block on a recent weekday afternoon, most residents and workers said they favored the idea of new housing, but most seemed surprised that a new hotel may soon be in the works as well. Adnan Guilar, 43, has lived on the street for ten years. By Becky Holladay. 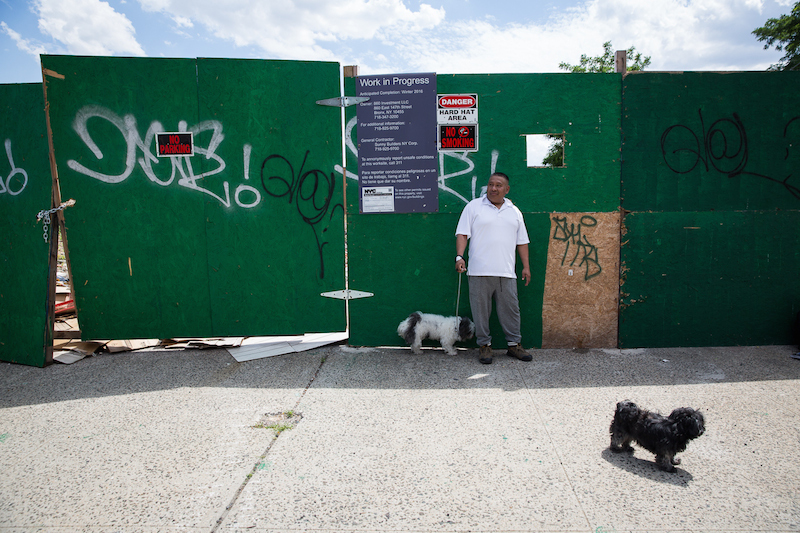 Adnan Guilar worries about a hotel expected to be built in the lot behind where he stands on 147th Street. “This is a quiet block. I’d be worried about a hotel. People might throw their garbage around,” he said, while out walking his two dogs. Though he was less worried about permanent housing, he said he is wary of so many people moving in. Benny Payero, 26, store manager at Bronx 99 Wholesale on the corner of Austin and 146th said squatters occupying the vacant houses on 147th Street may be behind a recent rash of car break-ins. He hoped new residents would help bring stability to the area. But Jimmy Vegas, who has lived in Mott Haven for 40 years and owns two buildings on Timpson, said he didn’t see the harm. “I see hotels popping up everywhere,” said Vegas, 50, adding that he recently turned down an offer by a Manhattan realtor to buy one of his buildings for $2 million. He added he is eager to see changes, and the new projects are a hopeful sign.